The earth’s crust is made up of seven main tectonic plates and numerous smaller plates. There are two main types of tectonic plate. Oceanic plates are relatively thin (about 6-10 km) and contain very heavy (dense) rocks such as basalt. Continental plates are considerably thicker (35-40 km) but contain lighter (less dense) rocks such as granite. The plates fit together like pieces of a large jigsaw. Tectonic plates meet along four main types of plate boundaries. The tectonic plates are in constant motion travelling at a few centimetres per year. The ocean floors are continually moving, spreading from the centre and sinking at the edges. 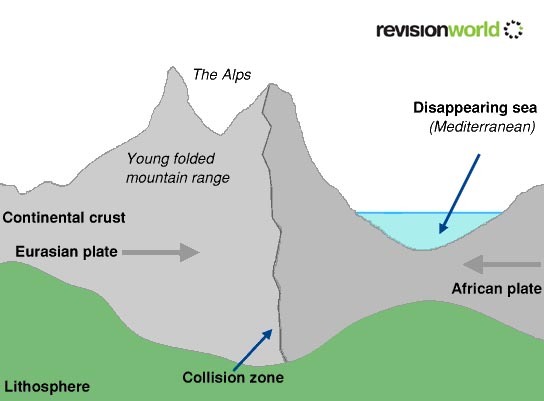 Where plates meet, huge forces build up causing earthquakes and volcanoes and the formation of fold mountains and deep-sea trenches. This short video provide an introduction into Plate Tectonics and charts some of the historic movement of plates. 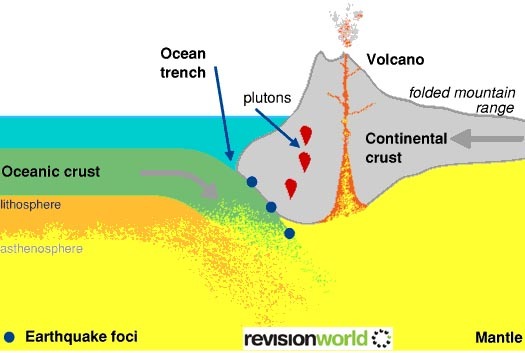 Hot currents of molten rock called convection currents move slowly within the earth's mantle which moves the tectonic plates above them in different directions. The source of heat driving the convection currents is radioactive decay which is happening deep in the Earth. Convection occurs because the density of a fluid is related to its temperature. Hot rocks lower in the mantle are less dense than their cooler counterparts above. The hot rock rises and the cooler rock sinks due to gravity. When two tectonic plates slide past each other without creating or destroying any land they form a conservative plate boundary. The plates often get stuck as they try to move past each other due to friction. Over time this builds up great pressure until finally they jolt past each other. The sudden movement causes an earthquake which may be violent and cause great damage. Constructive plate boundaries cause mid-ocean ridges, volcanoes and earthquakes, though often less violent than those on destructive plate boundaries. Volcanoes can form along the edges of the plate boundary due to the rising magma. These volcanoes are called shield volcanoes. Example: the North American plate moving away from the Eurasian plate formed the Mid-Atlantic Ridge and created Iceland through volcanic activity. When an oceanic plate and a continental plate move towards each other the denser oceanic plate dives under the lighter continental one creating a deep ocean trench. As the oceanic plate goes deeper into the mantle, increased temperature and friction cause it to melt creating a subduction zone. Newly molten rock is lighter than the surrounding rock so it rises through the crust towards the surface. If molten rock (magma) reaches the earth’s surface it may spread out along a fault line or it may erupt at a single point as a volcano. Example of an oceanic plate colliding with a continental plate is where the Pacific plate moving towards the South American plate at a rate of 9 centimetres per year. Example: Himalayas created where the Indian Plate meets the Eurasian Plate. 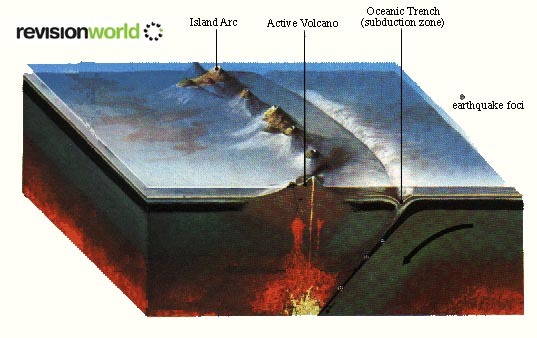 When two oceanic plate meet each other (oceanic-oceanic) this often results in the formation of an island arc system. As the subducting oceanic crust melts as it goes deeper into the Earth, the newly-created magma rises to the surface and forms volcanoes. If the activity continues, the volcano may grow tall enough to breech the surface of the ocean creating an island.